This is the sixth post in a series of channeled messages received from the Guides and Angels of the Light… If you would like to start with the first message in this series… Click Here! You now have the opportunity to fully ascend, to fully awaken to the unlimited power of your higher self. You have the opportunity to fully empower yourself to claim your role as conscious creator of your reality, letting go of any feelings of victim-hood. When you experience something in your life that you did not want to create, recognize it is your creation, nonetheless, and that it has been created for some learning, for growth. You are an unlimited spiritual being, in the physical realm experiencing the illusion of being limited. You are here for growth. It is through your challenges that you are often motivated to grow, to look deeper, to expand your perceptions and awaken to the remembrance of your true nature as an unlimited spiritual being. Open your heart and quiet your mind, tuning in to your feelings, knowing, perceiving and imagining, at first, that divine light, guides and angels all around you. The more you consciously try to perceive reality beyond your physical realm, the more quickly you will open to fully experience the energies that are present. Your physical world is connected now through a vast and intricate web to all that is. You are in no way isolated from the spiritual realm, from the heavens, or from the cosmos. Rather, right now from where you are in your physical body, you are able to tune in to all of these vibrational frequencies. And when you tune in to the vibrational frequency of the higher realms, of your sun, of light beings, of stars, of angels, even you cannot help but raise your own vibration. And as we have mentioned, raising your vibration is the direct path for you to fully and authentically connect with your full power, your full being, your true self, as an illuminated spiritual being of light. And of course, your every now moment is your opportunity to go within. And it is within you that you are able to gain the most knowledge, wisdom and understanding about your authentic truth, and unlimited light; all you need is access within. Your heart chakra is an amazing energy portal, which when opened, allows you to fully tune in to your higher self, to the messages and guidance of your angels, and to clear knowing of your connection with the spirit and clear knowing of your innate and powerful ability to manifest in your physical realm. Manifestation, learning, knowledge does not happen or come from outside of you, but rather from within you. With your beliefs, with your thoughts, with your emotions, you begin to create in the physical. From within the realm of the nonphysical, your physical world takes form. All the knowledge that you desire, that you seek, can be learned in a roundabout way through reading, through studies, through looking for truth outside of you. But until you get this truth, until you are able to tune in to your inner being, being still and calm in the moment through your open heart, then you will be unable to access all of the infinite intelligence, knowledge, wisdom of the universe. This information is light and it can be accessed within you. And so, by opening your heart, quieting your mind, and tuning in to the light all around and within you, great advances in your knowledge, in your physical vitality, in the joy, compassion and love you experience are made, these are all lifted, boosted, and empowered through light. When you are wondering about a choice you want to make in reality, if you are wondering whether your ideas are truly in line with your highest and greatest path, go within to find the answer. You could spend hours and days researching the ins and outs of the decision you want to make, or you can simply check in with your heart. Breathe and open your heart. 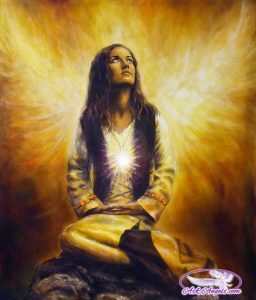 Just sit, feel, breathe, imagine you are surrounded with light, and know that your guides and angels and your higher self are with you. Feel their energy, feel the divine love and light and life force energy flowing through you. And now, drop into your heart more and feel your answer. How do you feel? Are you feeling loved? Are you feeling even lighter? If so, this is a sign that your idea, your intention is in line with your highest path. Move towards it. But when you ask, does your energy drop? Do you feel weaker like you are pulled away? Do you feel pain? This is an indication that your answer is no. This is a simple way of checking in and knowing your truth. Trust your feelings, your intuitions, your gut, for they truly serve you well. And as you practice this, checking in with your soul, with your spirit, the answers you receive will transition from a simple feeling to the clear concise answer about what is in line with your highest good. You can create anything you desire in this world by opening to the crystalline energies of light and love and using them to empower yourself to manifest in your world. This can be easily accomplished, or there can be a more challenging, bumpy and difficult path. This depends on whether what you are moving towards is in line with the intention of your higher self, of your heart, of your soul, the divine blueprint for your life, and your true intentions about what you want. If you are planning on manifesting something that goes against this, and you move forward, working on drawing it and attracting it to your life, be assured that there will be bumps, there will be challenges, and there will be struggle. The manifestation will not come easily, and this is not because you cannot have it, but you are challenged because your attention needs to be drawn to a higher, possible manifestation. Your soul is helping you to realize that what you are going after is somehow short of what you truly want at soul level and what you can create. Now quiet your mind and imagine it is a blank slate of white before you. Open your heart. And what message does your higher self, your soul give you now? Is this the highest possible manifestation for you now? Does it feel good? Is your higher-self validating your question with feelings of love and light, ease and well-being? Or is there a challenge that’s already coming to mind? Are you feeling weakened or drained? You have an answer. Use your intuition, your gut feeling, and your imagination to let this appear. Know your higher self is communicating with you, is answering this question. Thank your higher self for the unlimited guidance and knowing provided. And know that this simple act of checking in with your spirit, with your soul is so powerful because if you did feel a drop in your energy, if you did perceive some challenge, obstacle or a negative feeling, you know the answer was no. There is a higher manifestation for you to focus on and go after. To tune in to the knowing of what this is remember that all the knowledge you need, all the wisdom, all the guidance is already accessible from within you. Open your heart and ask, “What will bring me the fulfillment, love, and happiness I desire? What manifestation is for my highest good?” And let your mind be still and calm. Tune in to your feelings, and let the subtle energies of your psychic impressions come in. You have physical senses, but you also have intuitive and psychic senses, and these are how your higher self will communicate. Open these receptors and let the knowledge, the vision, the feeling of what truly is in line with your highest and greatest path, what truly is for the highest and greatest good of you and everyone in the earth, what is the higher version of the manifestation you can create. Let your higher self show you this, attune you to this, and let you feel this. For when you are in the process of creating, of manifesting that which is in line with your divine blueprint, with your highest and best possible plan for your life, it will flow easily and effortlessly with assistance from your higher self, from the universe. When things are meant to be, they will be. They come easily and without struggle. Remember this when you are struggling to create something you want. Experiencing struggle is a warning sign or flag, it is an indication that a shift is needed. The challenge shows you that you can perhaps rise above it and manifest something even greater than you were initially shooting for. And all you need to do to know is tune in, check in. The more you practice, the more you open your heart and ask, the more you commune and connect with your higher self, your spirit, the clearer the guidance will become. It just takes practice. When you’re starting, feel and then let this feeling evolve into clear knowing, clear understanding, and use this magical ability that you have, to focus and to create that which you really want at soul level, for this is what brings you fulfillment. And as you practice connecting with your higher self to know your course, to know your path, your connection is increased and strengthened each time you try. So daily practicing serves you to stay more on course. And also, you will consistently be moving towards holding, experiencing, encompassing more and more of your light, as a spiritual being, accelerating your energy, expanding your awareness, and allowing you to create in the physical realm and to experience all the love, the joy, the abundance, the peace, the fulfillment of your physical realm and of the spiritual realm. Remember that all you need is within: guidance, knowledge, courage, strength. Practice awakening and opening your heart to fully allow your divine love, your higher self to merge with you. Claim your power. Create blessings in your life. Click here to access Part 7 in this series of Angel Messages with the Guides and Angels of the Light- Perception is Reality. I love these messages. They are so honest so authentic. Each time they guide me to a higher vibration! They really help me to connect me with my True Self. I’m enjoying the free angel readings. They are light beings that help our spiritual journey.